The Floating Seahorse underwater villas: Dubai's newest frontier. Courtesy The Heart of Europe. Outer space and oceans have one thing in common: a whole lot of unexplored territory. The National Oceanic and Atmospheric Association (NOAA) estimates that despite making up more than two-thirds of the earth’s surface, more than 80 percent of ocean is unmapped and unobserved. Fortunately, the wonders of the world’s watery depths are already much more accessible than space will ever be. Will the sci-fi notion of an undersea existence ever become reality? 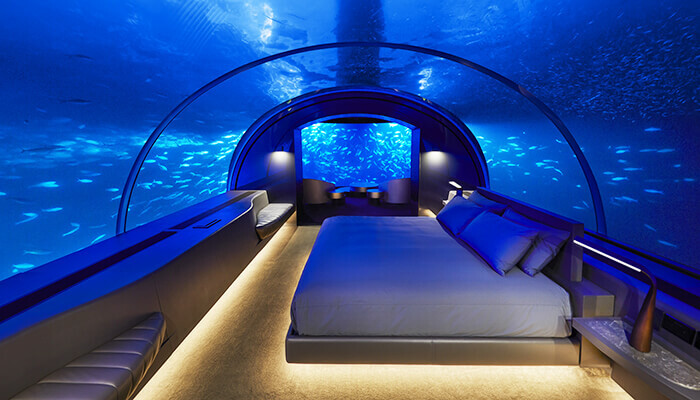 Today, underwater architecture generally falls under the realm of hospitality, with luxury hotels, villas, and restaurants dotting the oceans of the world. But as population growth and urban development test the limits of life on land, the sea might offer new potential for the cities of tomorrow. Tour some of the world’s most imaginative undersea structures, along with a few concepts for underwater urban centers of the future. If you have $50,000 to spare, you can afford a night at the Maldives’ Conrad Muraka, a two-story villa that sits above and below the surface of the Indian Ocean. The 600-ton structure was constructed in Singapore out of acrylic supplied by a Japanese aquarium manufacturer; it was transported on a custom ship to the Maldives, where it was submerged and secured in place by concrete piles. The hotel even has marine biologists on staff to make sure the villa minimizes its impact on the surrounding coral it’s named after. The view from the $50,000/night Conrad Muraka. Courtesy Conrad. 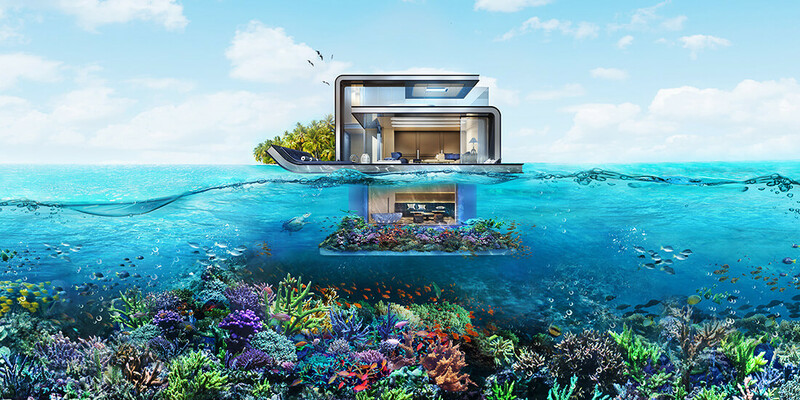 Located about 2.5 miles offshore from Dubai, the ultraluxurious Floating Seahorse villas mark the first time that homeowners can actually purchase a plot in the ocean. Design firm Kleindienst Group says the project is the result of more than 5,000 hours of research and 13,000 hours of design and engineering; 80 villas are nearing completion. Master bedrooms are underwater, offering views of a 500-square-foot artificial coral garden—a protected area meant to help restore the endangered seahorse population. Residents enjoy a floating bed and observation deck above water. Italian divers at the Ocean Reef Group have built the world’s first underwater greenhouses, named Nemo’s Garden, just off the coast of Noli, Italy. These greenhouses are part of an experiment aiming to tackle the challenge of producing food for the world’s growing population as water resources become scarce. The underwater farm comprises six air-filled clear-plastic pods; inside each, constant temperature and humidity and a high concentration of carbon dioxide create near-perfect conditions for growing crops such as beans, strawberries, basil, and lettuce. Each pod has sensors monitoring temperature, illumination, indoor humidity, carbon dioxide, and oxygen levels. The InterContinental Shanghai Wonderland is a subterranean hotel inside an abandoned quarry about 20 miles southwest of Shanghai. Of the building’s 18 floors, 16 are underground, with the lowest 2 submerged inside a 33-foot-deep aquarium. Built into the side of a quarry in the Sheshan mountain range, the hotel aims to be a home base for environmentally minded travelers. In addition to a green rooftop, the hotel plans to generate its own geothermal and solar energy to power everyday functions. Egypt has been floating around the idea of building an underwater museum since 1996, when government officials started studying new ways to better protect the valuable sunken artifacts of the Mediterranean port city of Alexandria. Currently, these relics are threatened by bay pollution, poaching, and fishing-boat anchors. The plan to build the museum in the Eastern Harbor area of Alexandria’s Abu Qir Bay was tabled during the revolution in 2011, but talks resumed in 2013. If the project is successful, thousands of sunken treasures would be brought into view for the first time in more than 1,400 years. Egypt also hopes that the museum will revive tourism in the port city and further research into the ancient ruins. Japanese engineering firm Shimizu Corp. has proposed a $26 billion self-sufficient, environmentally friendly underwater city called Ocean Spiral City. The design includes a tower within a spherical metropolis that can accommodate homes and workspaces for up to 5,000 people and a base station that can provide the city with essential resources powered by the ocean, such as energy, fresh water, and food. The spiral would generate renewable energy using a process called ocean thermal energy conversion (OTEC), which uses the difference between seawater temperatures to generate electricity. Clean drinking water could be produced through a process called reverse osmosis membrane desalination. The firm says Ocean Spiral City could be ready for human habitation by 2030. Belgian architect Vincent Callebaut has envisioned humankind’s future as “climate-change refugees,” living in underwater apartment complexes known as “oceanscrapers” that are 3D printed from recycled materials taken from the ocean’s floating garbage. He’s dubbed this project Aequorea, inspired by the bioluminescent jellyfish called aequorea victoria, or crystal jelly. He imagines a sustainable habitat with 10,000 housing units, workspaces, sea farms, gardens, and community orchards.